The R&S®NRPM consists of at least one antenna with an integrated diode detector, plus a spatially offset electronics module (sensor module). 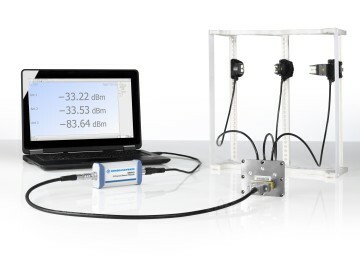 Measurement accessories for operation in a shielded chamber are also available. The R&S®NRPM is a new solution for direction-dependent measurements of the power of radio signals directly on the antenna. It enables users in development and production to calibrate the output power of a DUT in the high microwave range and to test the DUT’s beamforming function.